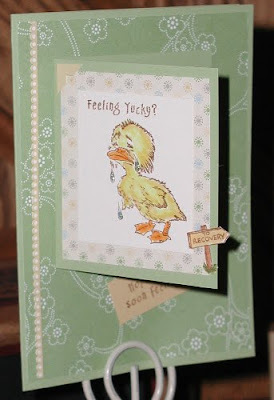 Last week on the Crafty Secrets' forum challenge on Splitcoast Stampers, Pammyjo asked us to create "piggyback" cards, a standard-sized card with a small card on the front. 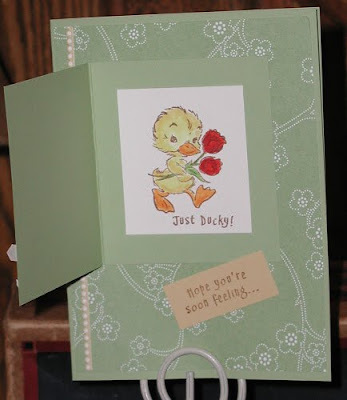 I created this card for a sweet lady from our church who is recovering from back surgery. Hope your day is just ducky too! I was just browsing the web and came across your blog. Your creations are lovely. This card in particular made me write a comment because it is soooo adorable :) TFS!!! You certainly outdid yourself on this one! Great idea to use the one image (feeling) on the front and other on the inside! FANTASTIC! !